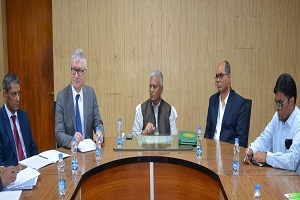 The team of Scientists from International Rice Research Institute (IRRI), Philippines led by its Director General Dr. Mathew Morrell, has visited the Professor Jayashankar Telangana State Agricultural University (PJTSAU) and signed an Memorandum of Understanding (MoU) with PJTSAU on 23-03-2019 in a meeting organized at the committee hall in the Administrative building at Rajendranagar. 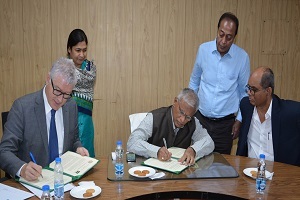 The MoU was signed by the Director General, IRRI Dr. Mathew Morrell and Vice Chancellor, PJTSAU Dr. V Praveen Rao. Earlier, the team met the Agricultural Minister of Telangana State Sri. S. Niranjan Reddy at his residence for courtesy and discussed about the proposed MoU with IRRI. As part of the MoU the capacity building programs will be organized by the IRRI to the faculty of PJTSAU on advanced breeding technologies and Mutual Student, Faculty exchange program between the IRRI and PJTSAU will be taken up. 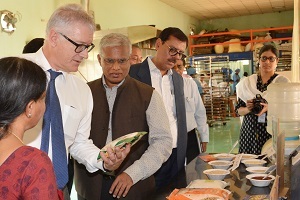 Both the institutes will initiate the Collaborative Research Projects in developing the new rice varieties for Resistance to Salinity, Drought tolerance, Pest and Disease. Market demand rice varieties like low glysemic index which more commonly preferred by the diabetic patients will be developed. IRRI and PJTSAU will prepare the action plan for rice varieties in view of the large scale irrigation projects in the state. The research programs will taken up on water use efficiency in rice crop and thrust will be given on khariff rice varieties. IRRI in principle has agreed to establish its regional center in the university campus for giving more thrust to the rice research programs in the state. 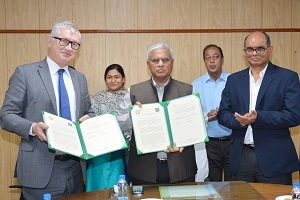 For which university is readily agreed to provide 20 to 25acres of land in the campus for establishing the regional IRRI center which is going to be a first center in the southern India said the VC, Dr. V Praveen Rao. 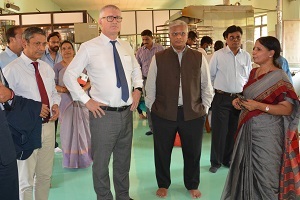 DG, IRRI has shown keen interest to work with the PJTSAU on collaborative research projects. In this meeting IRRI and PJTSAU has decided to prepare rice development project within next four months and it will be submitted to the State Government for implementation VC said. 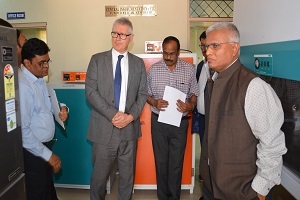 Dr. S Sudheer Kumar, Registrar, PJTSAU, Dr. Nafees Meah, IRRI Representative South Asia, Dr. Aravind Kumar, IRRI Representative for India and Director ISARC were present in the meeting. 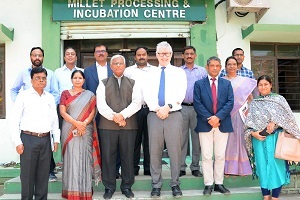 Later, the IRRI team visited Central Instrumentation cell, Millet Incubation center, Rice Research Scheme, Quality control lab of PJTSAU at the Rajendranagar campus.